What defines the lifestyle of the 21st century? Ask anyone, and you are almost sure to get “technology” as a general answer. That is not surprising, since modern-day digital technologies have introduced substantial changes to most aspects of our everyday life. Chatting with our friends on social networks, watching videos on our smartphones, streaming music online – nowadays, we do all these things on a regular basis. With almost half of the world’s population connected to the Internet, businesses of all kinds are bound to be affected by this rapid technological growth. In this article, we shall look into those technologies’ impact on shopping, both online and offline. 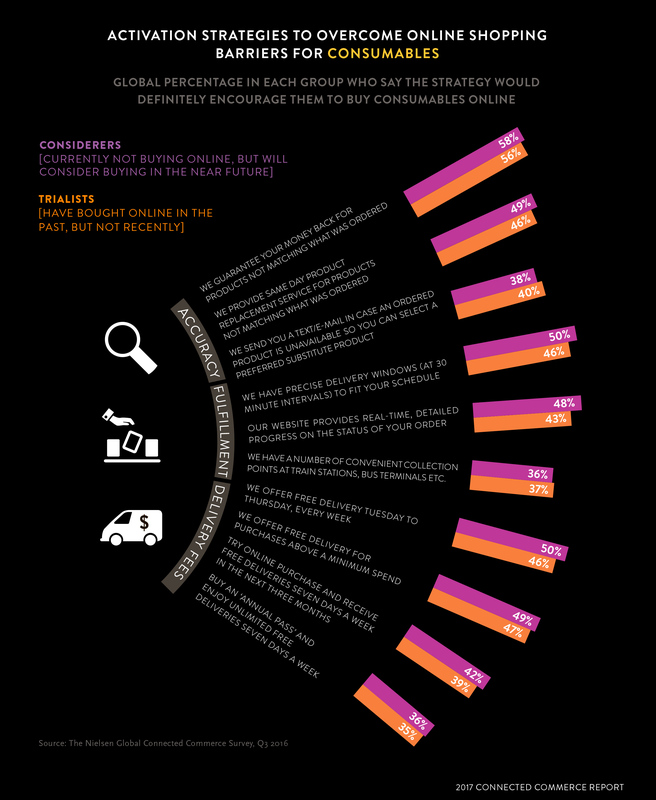 In order to illustrate some of the points of this article, we shall turn to the data derived from the Nielsen Global Connected Commerce Survey, conducted in autumn 2016 by Nielsen Holdings PLC, a global performance management company which specializes in consumer data analysis and covers over 90% of the world’s population. The survey polled over 30 thousand online consumers from all over the world and was aimed at highlighting the shopping habits of existing Internet users. The rise of online shopping is clearly one of the manifestations of today’s technological progress. E-commerce provides the consumers with more goods and services than they could ever find in traditional offline stores, and they seem to be taking full advantage of this new-found freedom of choice. In 2015, online’s share of total retail purchases in China accounted for 12.9%; for South Korea, this figure was 11.6%. In the USA, the amount of online purchases over the first 3 quarters of 2016 averaged out at 8.1% of the total retail sales; by Nielsen’s estimates, this figure is likely to grow at a compound annual growth rate of 12.2% over the next few years. However, it would be a mistake to say that online sales are going up while offline retail trade is experiencing a decline; in reality, online and offline channels are getting increasingly interconnected. Not only are traditional offline stores trying to expand their online presence; more and more online retailers are also seeking to open physical stores. How exactly is this interconnection going to function in the nearest future? Let us try to find out. Over 93% of the Nielsen Online Survey’s respondents state they have shopped online at least once in their lives. The categories of goods likely to be purchased online are, however, constantly shifting. As expected, the categories that originally were the basis for e-commerce – durable goods and services – are still in the lead today. 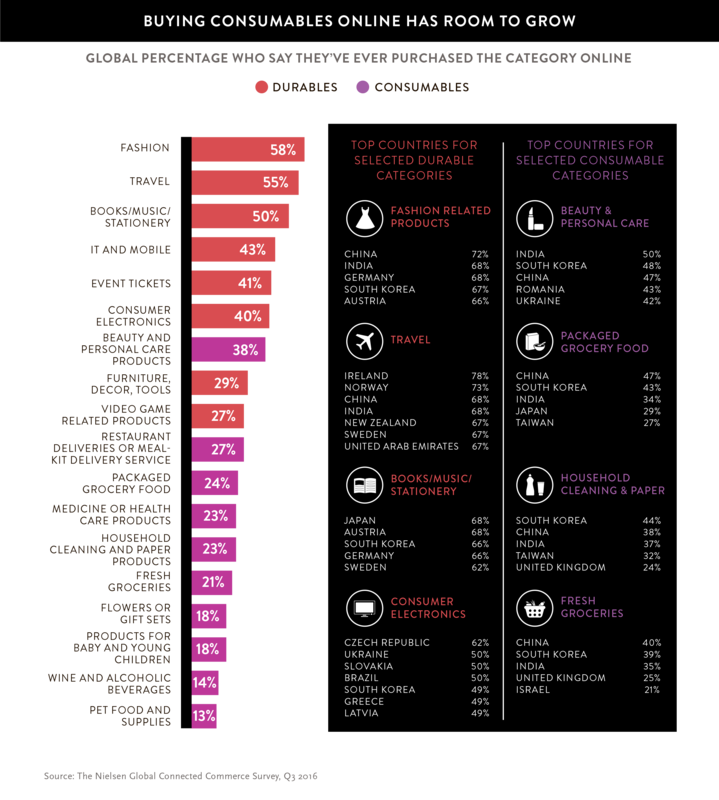 Over half of the global respondents have bought fashion products and travel-related services online (58% and 55% respectively); almost as many have purchased music, books or stationery from online stores. Consumable goods are a different story, though. It has taken them much time to gain popularity with online customers, but certain categories seem to be improving quite rapidly in this regard, especially those that cater well to particular needs. 38% of the respondents have purchased personal care and beauty-related products online, while about 25% have ordered packaged grocery food or meal-kit deliveries. Meal-kits are, in fact, a particularly good example of consumable goods that are likely to be popular among online customers. They offer a wide variety of flavors, traditional to exotic, and they offer straight-to-the-door delivery of ingredients complete with cooking instructions, saving the customer a lot of time and effort. To top it all, meal-kits cater to the needs of those who want to lead a healthier lifestyle, which has been a strong trend of its own for the past few years. Meal-kits are obviously doing well online, but what about fresh groceries? For those, a big part of the appeal lies in their physical look and smell – something that images simply cannot replace. Online shopping for fresh groceries seems to be gaining popularity in a number of Asian countries, but in the rest of the world, it still has a long way to go. The situation is likely to turn for the better, though, as quality assurance is guaranteed, and delivery services continue to improve. When talking about the customers’ online or offline preferences, there is one important thing to keep in mind: having purchased certain goods or services online, the customer is not bound to shop for them online in the future – in fact, some of such customers are likely to revert to in-store purchases. Once again, this consumer behavior can be predicted based on the category of purchased goods or services. According to the Nielsen Online Survey’s results, online can become the preferred channel for customers who have bought travel-related goods or services, event tickets or video games: over half of the respondents who have bought such products online say they are more likely to keep purchasing them online in the future. However, the same cannot be said about some other durable goods, particularly those with higher price tags and less frequent purchasing cycles. Fashion-related products, furniture and consumer electronics seem to be the categories which are more or less equally likely to be purchased either online or in-store after the initial online purchase – in other words, online does not become the dominant channel for future purchases of such goods. Consumable goods also show mixed results in this regard: while household cleaning and paper products are more likely to be purchased online by 41% of the respondents, some other categories are doing far worse – fresh groceries, for instance. Speaking of those, regardless of their relative unpopularity online, their online customers can be divided into several distinct groups: “regular shoppers”, “considerers”, “trialists” and “avoiders”. The names are pretty much self-explanatory: some customers shop for fresh groceries online on a regular basis, others consider trying it in the future, still others have already tried that but have switched back to in-store purchases; finally, there are always customers who tend to avoid online shopping in favor of in-store purchases. The big question is, can “considerers” and “trialists” be converted into “regulars”? The short answer is: yes, they can. There are, however, considerable obstacles to overcome first. For example, 64% of the respondents are concerned about the quality and freshness of the groceries sold online; 69% say they prefer to inspect groceries on their own before making a purchase. Over half of the respondents in Nielsen’s 2015 Online Survey also expressed their concern about delivery schedules and order accuracy. Obviously, all these points should be addressed by online retailers in order for fresh groceries to become a viable online offer for a large number of customers. Judging by the data derived from the survey, addressing accuracy concerns should be the top priority for fresh groceries (and for all other consumable goods, in fact). Both “considerers” and “trialists” state they would like to be offered a money-back guarantee in case the delivered products do not match what was ordered. As for delivery-related concerns, about half of the “considerers” and “trialists” would be ready to buy fresh groceries online regularly if they were offered precise delivery times to fit in their schedules; free delivery on certain days every week would also encourage them to shop online more often. Free delivery for orders over the minimum spending level is another attractive offer to those customers. The effectiveness of such offers differs from region to region. While a money-back guarantee seems to be the most effective message globally, it is at its best in developing markets; the more advanced the market is, the less effective this offer becomes. 62% of Indian respondents would be ready to convert to “regulars” if offered a money-back guarantee; for advanced North American, Asian and European markets this figure is only 46%, 37% and 36%, respectively. The other aforementioned activation strategies behave the same way. 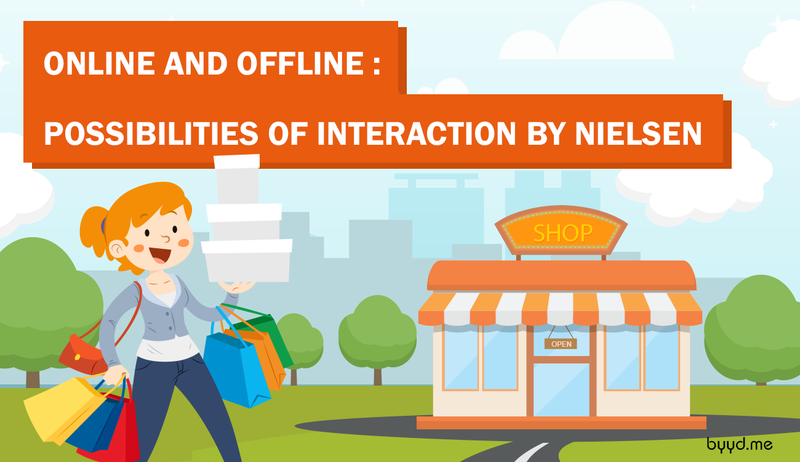 To conclude, we should once again state that online and offline shopping are closely interconnected, and this complex relationship is dynamic by its nature. In order for a business to succeed in the present-day situation, it should take into account numerous factors: the category of the goods and services it offers, the region it operates in, the needs and concerns of its customers. 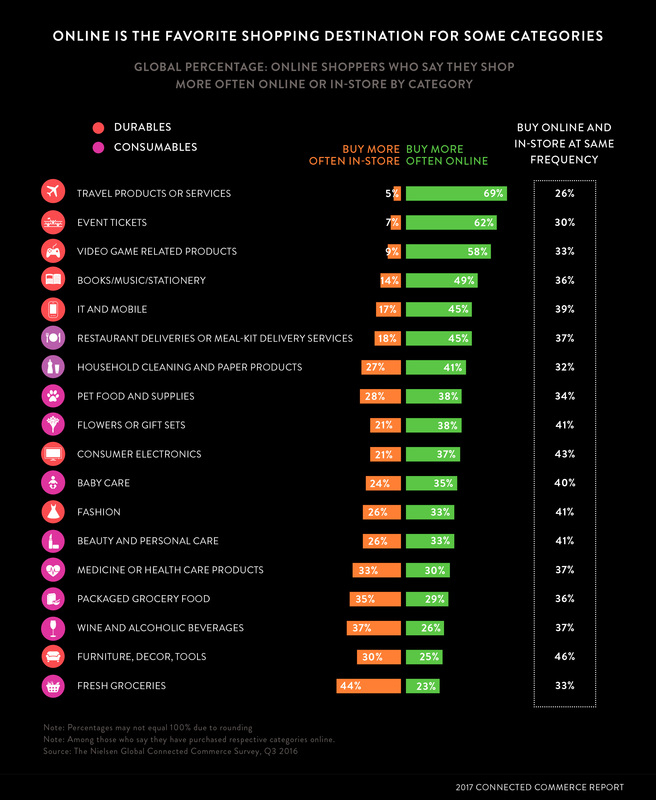 In terms of online purchases, certain durable and service-oriented categories (such as travel or fashion) are firmly in the lead, but particular consumables (meal-kits, beauty-related products) are quickly gaining popularity, too. Some durables are also likely to be bought online after the initial online purchase; the opposite can be said about certain consumables, particularly about fresh or packaged groceries, as well as about medical goods. For the latter, specific activation strategies (such as offering a money-back guarantee) can be used in order to encourage more customers to buy such products online on a regular basis; addressing quality concerns is also crucial in this regard.